Maren’s stuck at the intersection of heartache and love, but happily ever after might be just around the corner. But as the New Year approaches, is Maren headed for heartache again when Zane’s lost love returns or has time changed more than one heart? This was one of those books that I just loved! I loved the plot and the characters, really everything about it! I liked Maren. She’s about ready to get married. But her job keeps taking her away from planning her wedding, so she has her sister Tori fill in for her during most of the preparations. The only problem being Tori and her fiance Kevin end up eloping. Wow, I really felt sorry for Maren when that happened. Especially when Kevin ends up being her boss at work as well. Talk about having salt rubbed in her wounds. I liked the way Maren worked hard to move on. She works hard at everything she does. Trying to move on, Maren moves in with her friend Cassidy. And that’s when she meets Zane. I loved Zane. He’s trying to move on from his own broken heart by waiting on the corner where he planned to meet his girlfriend. But she never showed up. So he vows not to leave the corner for a year or until he sees her again. I loved Zane’s patience, his loyalty, his kindness. He’s such a great character! I loved the way the plot of this one moves. The author did a great job showing Maren trying to move on. She has some different options of guys to move on with, but picks the one that works best for her. I really loved everything about this one, except for Maren’s backstabbing sister and fiance! But that just shows that the author did a great job writing all of her characters. 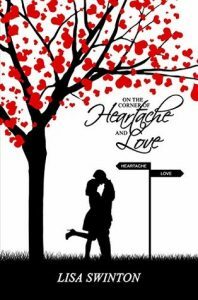 I was sent a copy of On the Corner of Heartache and Love as a gift from the author. All opinions are my own.